Develop the critical thinking skills you need to choose and fit effective orthoses for patients with hand injuries and functional deficits. As a combination workbook/textbook, Introduction to Orthotics, 5th Edition uses reader friendly language to cover the theory, design, and fabrication of orthopedic devices. 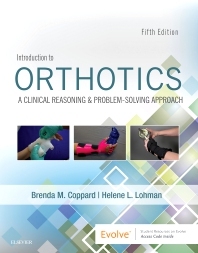 Ideal for use in the classroom or in the clinical setting, it emphasizes upper extremity versus hand orthoses, with additional coverage of lower extremity orthotics and upper extremity prosthetics, and offers case studies promoting clinical reasoning and problem solving as well as an occupation-based approach. This new edition also demonstrates the fine detail of orthotics and equips you with a repertoire of skills and knowledge related to orthoses. Updated content, references, grading forms and self-evaluation, and case studies provide students and practitioners with the most current and up-to-date information they need to prepare to serve their clients’ needs. Numerous case studies in each chapter show how concepts relate to real-life clinical practice. How-To videos on the Evolve companion website let students watch the construction of orthotics again and again to increase their proficiency. Integration of patient safety addresses this important aspect of patient care. Self-evaluation forms allow you to analyze personal strengths and weaknesses related to new orthotic intervention techniques.